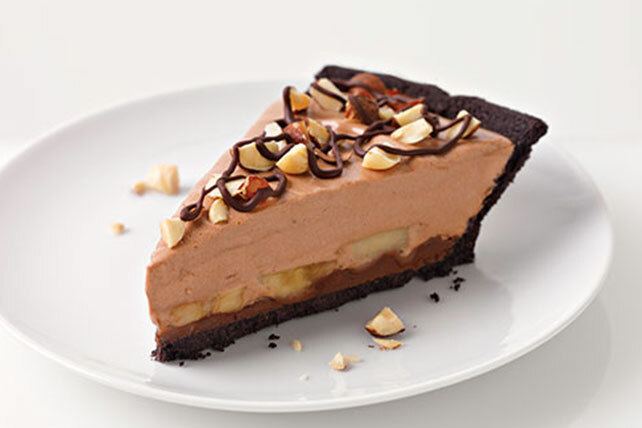 We figured you wouldn't believe how easy it is to make this no-bake Chocolate-Hazelnut-Banana Pie—so we shot a video so you could see for yourself! Whisk chocolate and 1/2 cup COOL WHIP until blended; spread onto bottom of crust. Top with bananas. Prepare using 1 pkg. (1 oz.) JELL-O Vanilla Flavor Fat-Free Sugar Free Instant Pudding and COOL WHIP LITE Whipped Topping. Garnish with chopped toasted hazelnuts and a drizzle of additional melted chocolate just before serving.